Do you like the new look of my little space here? It has been 4 years since I changed the look of this blog. Given there will be some new beginnings, I thought it was a good time for some changes. It certainly reflect my inner self. Less cluttered, clearer and generally older! If you are into social media, follow me on Facebook or even instigram- I would love to hear from you. I will probably posts photos of our life journeys and bakes/cooks that may or may not make it here. I am approaching the last weeks of pregnancy now. Bub is due anytime. I took parental leave early, partially because due to the nature of my work, it was recommended that I am home early. It’s a funny feeling being at home after working for a few years. The hubby commented that standards of dinners has improved, and he has less housework to worry about. I could wander around the shops in the day and take my time browsing at shelves. The house is more organised and cleaner, with clothes actually hanging where it is supposed to be at rather than in piles in baskets on the floor in our room. I’m catching up with a few friends during the day, and could enjoy the winter sunshine when we get it. It’s a total different lifestyle. Do I prefer it? or do I miss work? To be honest, it’s abit of both. I think I’m feeling the “honeymoon” of being at home and enjoying some peace, quiet and “me/us” time before baby arrives. I get to do things that I want to do with less stress. I miss the challenge of work and my colleagues. Work to me is not just a pay check. It will be interesting next year, when I have to decide when or if I do want to return to work. After having a tricky few months to this pregnancy, I’m actually enjoying the 2nd half of 2nd trimester and of course, now the 3rd trimester. While I feel huge, it’s an amazing miraculous sensation feeling bub kick and respond to stimuli. I can’t wait to see baby, but at the same time, feeling protective of him in the womb. I’m nervous about labour, but excited that our new life will begin. I’m also looking forward to all the great confinement food that my grandmother is an expert about. Given that I have been sharing my favourite breakfasts with you, here is another one. It is adapted from one of my favourite bloggers PaleoOMG– she comes up with the most amazing clean recipes. If you are looking for a delicious pancake recipe that won’t make you feel that you have an unhealthy morning- this is for you. Something to welcome the weekend! 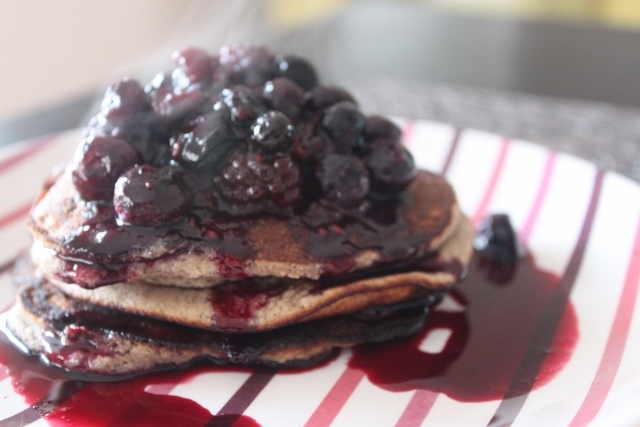 Blitz everything except berries and honey in a food processor. Heat pan with some coconut oil. Spoon a tablespoon of mixture and spread it out on pan. Cook till you see bubbles on the top and flip it. Repeat for rest of the batter. In a saucepan, heat berries (I used frozen) with some honey. 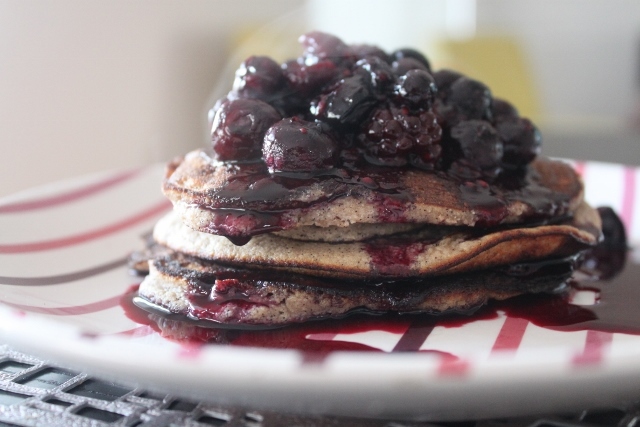 Stack pancakes and spoon berries on top. Tuck in. 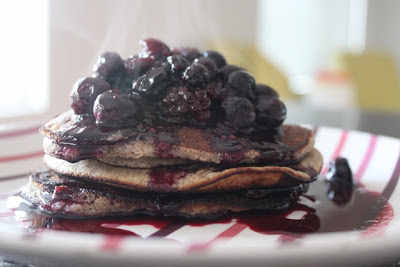 This entry was posted in Breakfast, Brunch and Breads, Eating clean, Pregnancy, Quick and Easy.